In light of the recent deaths at Narconon Arrowhead and the news reports coming out about Narconon from around the world, I felt like I had to put in my two cents worth as well. Most of this is probably old news to Scientology watchers, but I hope to educate some folks, and hopefully, keep some unsuspecting victim from going to a non-medical, un-certified drug and alcohol treatment program. Let's get this out of the way right off. 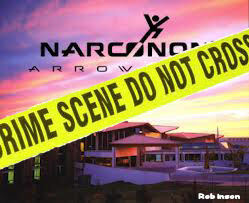 Narconon is Scientology. I know, Narconon says they just use some of Hubbard's materials, but they are not part of Scientology. And, Scientology says that they support the actions of Narconon, but they are not over Narconon. So, in police detective language, let's "follow the money". By the way, the average charge for the Narconon program is $35,000 U.S.D. Cash. has been classified as a "Scientology-related entity" Through A.B.L.E., Narconon send at least a 10% "donation" to Scientology from it's weekly gross income for the use of the Hubbard "trademarks". It may also only purchase it's training materials from Bridge Publications which is another Scientology corporation. You need more evidence? Ok. One of our favorite sources, David Love (click here to see his web site), tells us that although the Scientology E-Meter is not used on patients, many staff members have their meters on the property to use on themselves and other staff members. Scientology says that no one may be in possession of an E-Meter unless they are a trained Scientology auditor (counselor) and they must be a Scientologist in good standing. Mr. Love also says that after a patient has graduated, they are given an interview, and then a Scientology security check, which is always done on the meter, then they are informed that the only way to make sure they remain stable in their sobriety, they need to do a process called the Scientology Drug Rundown, which can only be delivered at a Scientology Org at a cost of about $5,600 per 12 1/2 hours. The student moves the coach's body around a room. In the first half of the routine the student "steers" the coach by silent actions. In the second half, the student uses verbal commands such as "Walk over to that wall." Each successful verbal command must be acknowledged. This routine is similar to TR-6, except that the coach resists the student verbally and physically. The student may use physical contact to enforce a command. The routine continues until the student can fully control the coach despite attempts to stop control. As in TR-6, the student moves the coach around a room with verbal commands. The coach resists, and the student must use a combination of smooth physical control and unspoken intention to make the coach obey. The routine continues until the student can maintain exact intention despite resistance. In Scientology, these are known as the Upper Indocs (Indoctrination: to imbue with a usually partisan or sectarian opinion, point of view, or principle). The only purpose of these TR's is to teach the student to be controlled by another and to be able to control others. As for the Purification Rundown (at Narconon it is known as the "sweat program"), it is a potentially deadly process that consists of taking massive (toxic) doses of vitamins and minerals, exercise and up to 5 1/2 hours in the sauna per day. They will not tell you this, (because secrecy is the Scientology way), but to a person who has suffered many years of alcohol or drug abuse, high amounts of Niacin can shut down a person's liver that has already been compromised by alcohol and/or drugs. If you have never seen anyone who has died of Cirrhosis, I can tell you it is a horrible way to die. And lastly, I will let David Love tell you about the feeling of loss, pain and guilt that the staff member has to deal with. Thank you for being here.